The Grove at Vintage Oaks is a gated community in New Braunfels, TX. Built within the master-planned community of Vintage Oaks, residents of this neighborhood enjoy access to a resort-style amenity center, year-round activities and classes, and miles of trails that wind through the scenic Texas countryside. The Grove at Vintage Oaks features highly customizable single-family homes designed for first-floor living and easy maintenance. With San Antonio just a 45-minute drive away, homeowners are never far from the city. Residents of The Grove at Vintage Oaks enjoy access to a long list of resort-style amenities offered at Vintage Oaks as well as an additional fitness center that will be built within the neighborhood. The Fitness Club will feature cardio rooms, spa rooms, locker rooms, and an indoor pool. The Grove at Vintage Oaks is surrounded by 100 acres of greenbelts, which include links to over four miles of paths in the Vintage Oaks Hill Country Trail System. 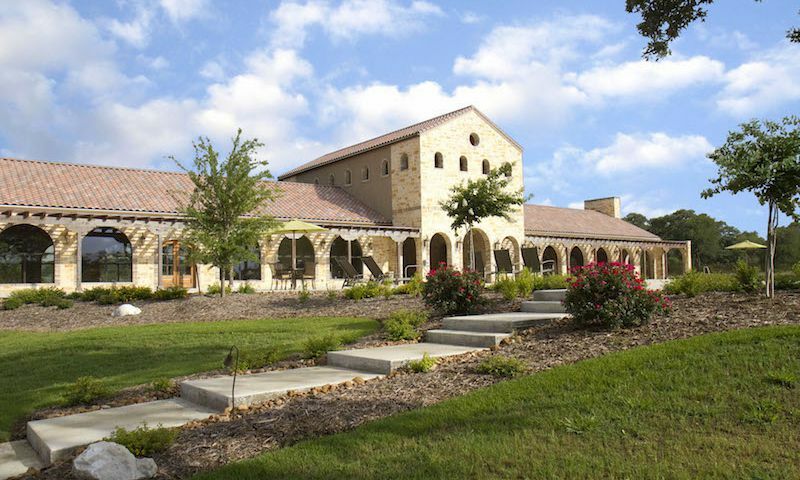 Over at the Vintage Oaks amenity center, homeowners find a Tuscan-style clubhouse with meeting rooms for holding events and a fitness center. A catering kitchen, bar, and grill is available for events while an outdoor patio provides a place to unwind. Residents and their guests stay cool with access to an Olympic-sized swimming pool, a children’s pool, and a lazy river pool. Tennis courts, a basketball court, a soccer field, and a baseball field can also be found near the clubhouse. A picnic area shaded by oak trees and a native flower garden are great places to relax after a day of recreation. Construction of The Grove at Vintage Oaks began in 2017. Upon completion, this neighborhood will feature 111 single-family homes built by the area’s most acclaimed builders. Homebuyers can choose from a long list of customizable floors plans that range in size from 2,153 to 4,191 feet and include three to five bedrooms, two to four-and-a-half bathrooms, and two or three-car garages. An exciting array of features are available, including stone fireplaces, granite countertops, and hardwood floors. Homes are designed for entertaining and easy living, all with master bedrooms on the ground level. The Grove at Vintage Oaks features smaller lots that require less maintenance, and with 100 acres of scenic open space surrounding the community, residents don’t need a big yard to enjoy the countryside. Homeowners at The Grove at Vintage Oaks find plenty of activities and events to join in on throughout the year. They build lasting friends at the adult socials, owners wine club, and dinners out on the town. A book club meets regularly to discuss novels and share insights, while a Labor Day pool party offers an opportunity for fun in the sun. For a little friendly competition, several bunco groups meet to throw dice, while pickleball and tennis are played on the tennis courts. Residents looking to stay in shape while having fun can choose from circuit class, water aerobics, or yoga class. Neighbors also meet for evening hikes through the community’s spectacular scenery, and the San Antonio Road Runners host the Whine Run race through Vintage Oaks in the fall. Surrounded by 100 acres of scenic, open land, The Grove at Vintage Oaks is full of picturesque views of the Texas countryside. Downtown New Braunfels isn’t far away, where shopping, restaurants, pharmacies, and entertainment can be found. Landa Park, a 51-acre riverside park, features a nature trail, picnic tables, and an 18-hole golf course as well as miniature golf. Homeowners can get to the heart of San Antonio in 45 minutes with easy access to I-35, and San Antonio International Airport is even closer. With resort-style amenities in a serene location, The Grove at Vintage Oaks in New Braunfels, TX is sure to please homebuyers seeking a beautiful home in a fantastic community. The Grove at Vintage Oaks plans to build a new Fitness Club within the neighborhood. Residents of The Grove at Vintage Oaks enjoy access to all amenities in the master-planned community. There are plenty of activities available in The Grove at Vintage Oaks. Here is a sample of some of the clubs, activities and classes offered here. Construction of The Grove at Vintage Oaks began in 2017. Upon completion, this neighborhood will feature 111 single-family homes built by the areas most acclaimed builders. Models by Monticello Homes range in size from 2,153 to 3,190 feet and include three or four bedrooms, two to three-and-a-half bathrooms, and two or three-car garages. An exciting array of features are available, including stone fireplaces, granite countertops, and hardwood floors. Construction of The Grove at Vintage Oaks began in 2017. Upon completion, this neighborhood will feature 111 single-family homes built by the areas most acclaimed builders. Models by Scott Felder Homes range in size from 2,519 to 3,843 feet and include four or five bedrooms, three to four-and-a-half bathrooms, and two or three-car garages. An exciting array of features are available, including stone fireplaces, granite countertops, and hardwood floors. Construction of The Grove at Vintage Oaks began in 2017. Upon completion, this neighborhood will feature 111 single-family homes built by the areas most acclaimed builders. Models by Perry Homes range in size from 2,501 to 4,191 feet and include four or five bedrooms, two to four bathrooms, and two or three-car garages. An exciting array of features are available, including stone fireplaces, granite countertops, and hardwood floors. Have to admit, I was very impressed. They just opened but they have a lot going for them. The builders are great, a new clubhouse is going to be built for The Grove owners only, but they still have a phenomenal clubhouse to use right now. There is a resort pool and lazy river. Very cool. 55places.com is not affiliated with the developer(s) or homeowners association of The Grove at Vintage Oaks. The information you submit is distributed to a 55places.com Partner Agent, who is a licensed real estate agent. The information regarding The Grove at Vintage Oaks has not been verified or approved by the developer or homeowners association. Please verify all information prior to purchasing. 55places.com is not responsible for any errors regarding the information displayed on this website.